It was announced today that Nestle has voluntarily recalled two varieties of Hot Pockets. 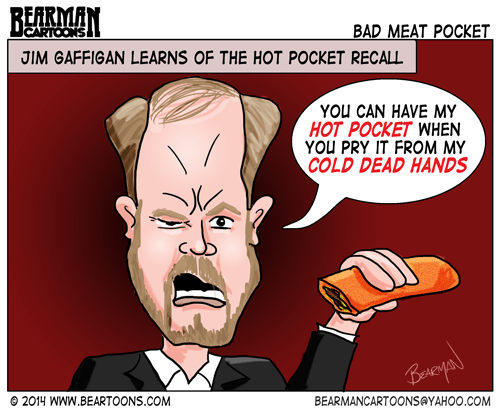 For those who follow comedian Jim Gaffigan, you may know that he is known for his bits about loving Hot Pockets. Wouldn’t Charlton Heston be proud that Jim would hold on to that Hot Pocket until you pry it from his cold dead hands? I’ve been in love with Hot Pockets since they first premiered and the only flavors were: pepperoni, ham and cheddar, and barbecue. If a tomato is really a fruit, does that mean that ketchup is actually a smoothie? I love Jim Gaffigan! I don’t know why he hasn’t hit it big with a tv show or something. I mean, of course he has no problem filling up any place that he appears. I had no idea about the hot pockets and I’ve never had one but I think Jim is already working on some bits about this. You can heat up those hands in the microwave! I’ve never had one, but he describes it exactly the way I’d expect it to be. I’ve not had hot pockets and now I know why. Bwahahahahahaha. I’ve not heard that routine before either. Too funny. Used to like those but then I entered my thirties a few years back and I can’t eat that kind of stuff anymore. Pizza rolls were great also. Oh and there is that thing about getting married and my wife being an excellent cook. I love his warning. I tried one once. I think it has finally left the building. I’ve never had a Hot pocket in my life. I prefer hot chocolate. And no one had better recall that! You have faulty recall. Perhaps that was you? If I had Total Recall, you would have to call me Arnold. I actually like Hot Pockets, if only they allow me to make the 2nd cheapest lunch for work (PB&J being the first). Very surprised reading about the recall. I’ve had my fair share of hot pockets! …and lived to tell about it. Hot Pockets always look SOO GOOD on the box. They catch my eye, I buy it and toss them in the microwave. Then, after first bite, I realize that looks can be deceiving and start to crave ANYTHING else. There is a fine line between scorching and rock hard. Michelle is going away for 2 weeks so I know what I could buy to get me through all those lonely meal times. Never seen the Tim guy before. What a hilarious bloke, loved it. I wonder if they do a fish hot pocket??? Or a Big Mac in a hot pocket??? Oh how I love Jim. Got to see him live last year and the crowd was practically chanting “HOT POCKETS, HOT POCKETS…” Great toon man! Yes! Gaffigan is awesome. The Pizza Hut sketch is pretty good too.